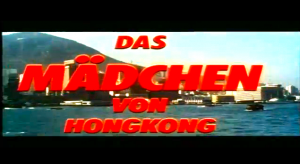 A small promo-video for our german crime, thriller, adventure movie-soundtrack release “Das Mädchen Von Hong Kong” with famous actor & showman Joachim “Blacky” Fuchsberger, directed by Jürgen Roland from 1973. This movie was shot 1972 in Hong Kong with an international flair and all the music was written by Gerhard Narholz under different pseudonyms. The soundtrack was never release before and will be available as a vinyl album & digital at our shop soon.